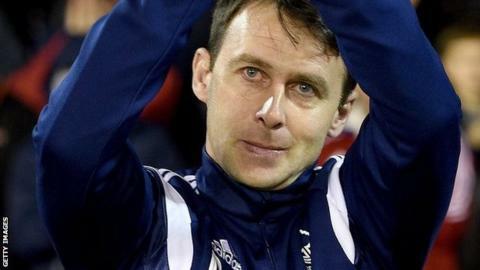 Manager Dougie Freedman has said he has shaken hands with Nottingham Forest owner Fawaz Al Hasawi on a new deal with the Championship club. The 40-year-old told BBC Radio Nottingham he expects to sign the new contract before the weekend. Former Bolton manager Freedman joined the club in February following the dismissal of Stuart Pearce. He signed an 18-month deal, but his position at the club was set to be reviewed at the end of the season. "There's no problem from my end at all, it's just getting something in black and white," said Freedman. "But there has been a handshake so I don't see anything that will stop us going forward." Forest have had six different full-time managers since Al Hasawi bought the club in July 2012, but Freedman says he wants a more stable environment at the club. "He's been there a few years now, and he's had a few ups and downs, but I think he'd like a little bit more stability," added Freedman. "The chairman wanted to tell me where the club's at and how he sees it going forward. "He said what he wants to put in place and one or two things he would like to make sure is done in the future, and I agree with it. "I told him I can implement exactly what he's put to me." Forest, who face Huddersfield on Saturday, have won seven of their 13 games since he took charge, and currently sit ninth in the table.